Ask anyone in your circle that may be in a position to help you. In my previous blog post I spoke about how the gravity of the choices facing our students could be, amongst other factors, having a demonstrably negative impact on their wellbeing and mental health. This is an idea that has certainly gathered momentum and support in recent years and arguably now more than ever is at the forefront of the Department for Education’s collective minds, with the department clamouring for teachers to have ever more training and understanding of basic mental health issues, how to identify them and what the first line of response should be. Due to the constraints of the blog format and not wishing to outstay my welcome in the first post I left something of a hanging chad – ‘You need to help your child more!’ – and then departed without offering any practical hints as to what and when you can be doing things that may be beneficial. So, the idea behind this blog post is to identify a few simple things you can practically do that may help alleviate some of the stresses of future planning that your child(ren) are facing. Talk to them – It sounds like an absurd truism but in amongst everything else in our respective lives sometimes shushing the external becomes an obstacle that gets in the way of the practical things like making dinner, work, activities and so on. Try and make time to really talk and more importantly really listen to what your child’s hopes and expectations are for the future. It may be you have very strong opinions about what your child should do but it’s important that you listen to what they want to do. Bear in mind the prescribed routes of your youth are no longer necessarily as pertinent to the current job climate as you might imagine. If you are trying to convince them to go to university that’s fine, if that’s what they genuinely want. Whilst it’s reductive to suggest that university is only useful if it’s geared towards a career, if your reasoning for wanting them to go is for job prospects it may be there are other better routes. Additionally in an attempt to please you it will be a debt they are burdened with for the first half of their working life. If your desire for them to go to uni is based on helping them forge a better life then saddling them with an enormous debt, unless there is a solid basis to think a degree will deliver them into the waiting, lucrative arms of a well paid position, it may not be in their best interests. It’s impossible to overestimate how much anxiety is a direct response to children wanting to please their parents. Through our ambition for them, our desire to see them succeed we may be unwittingly creating an environment of tension and panic and perhaps worse making one where honest discussions about their own ambitions cannot be had due to their fear of disappointing us. So listen to what they say, hear them out, give them an opportunity to articulate what/how they see the next few years unfolding and when you have a clearer view of an endpoint (because higher or further education is not an end in and of itself, merely a stepping stone), explore which of the available options is likely to be the most realistic and supportive of those aspirations. Be shameless – Most children aren’t fortunate enough to have a fully realized plan for their futures, they might have loose ideas about where they might want to live or a field of interest. Something in the law for instance. Now to take that an example, something in the law is pretty vague but by exploring the field they may be able to refine and hone that field and start to narrow it down into a potential career path which in turn will reveal which of the educational options best suits them. When I say be shameless I mean really wrack your brains, who do you know in that field that may be able to offer them some work experience, answer some questions, refer them to others working in the area? Ask your friends, neighbours, relatives, parents at the school gates, the school themselves, local businesses, your colleagues and so on. Every social interaction you have may also possibly throw up some opportunity, don’t be British about it, if you’re afraid to ask – imagine how your child feels. The single greatest thing a student can do when faced with these decisions is to get some work experience, firstly because it’s good fodder for either a personal statement or a CV and secondly because it will help either confirm or deny their interest in an area and it’s much better to learn something isn’t for you before you commit to a 3 year degree. 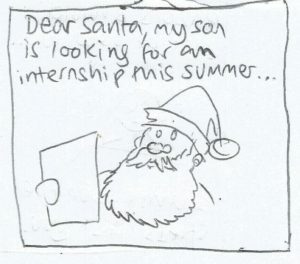 With the Christmas holidays coming up there’s an opportunity to organise some work experience activity, even a few days regularly can make a huge difference, hell when you’re writing your Christmas cards you have an opportunity to ask whether anyone in your circle might know someone who could help your child and you can dress it up as season’s greetings! 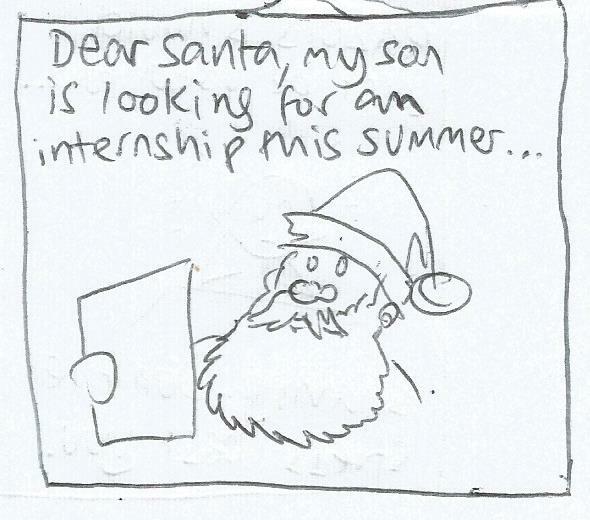 (https://edducan.com/2017/07/25/careers-planning-starts-with-good-work-experience-thats-what-the-holidays-are-for/) If you don’t ask you don’t get and as most students view the present as an inconvenient preamble and the future as too abstract to worry about anything you can do to help them in spite of themselves is going to make a big difference. Be proactive – They will likely assure you that everything is fine, it’s all in hand and so on but don’t take it on faith. Hector them as much as you can to make sure they are hitting their marks so to speak. This is a busy time of year, particularly for children in the Sixth Form. Lower Sixth – if they are university bound or at least thinking about it need to have a personal statement ready to go as soon as possible and with a largely homogenized cohort of students any work experience they can cram in to distinguish themselves from their competition would be immeasurably helpful. The personal statement was once seen as filigree but the evidence suggests it is becoming increasingly crucial to a selection or admissions committee in deciding whether the candidate has not just the academic chops to stay the course but also the wider commitment and interest in the field. That’s an argument that’s easier made when you have demonstrable experiences of having sought out opportunities whilst at school (see point 2 about work experience). Whilst I’m speaking about personal statements here the idea of being proactive and using the holidays and free time is a universally applicable one and honestly the younger the better. The sooner a child can engage with the world of work and the place they want to inhabit within it the better. There is too large a disconnect between education and careers, as if one has nothing to do with the other. If a child is interested in an area and they secure and enjoy work experience in that area it immediately gives a purpose to their school work, knowing what their goal is and having it be tangible is invaluable as it links two previously disparate ideas. I appreciate that hounding them may not be enviable and certainly not at the cost of heaping on additional pressure but like any leviathan of a task the longer it sits about your shoulders the more it weighs you down. The short term annoyance will hopefully give way to longer term relief, the more they do now and the more you help them do what they need to now – the easier their lives will be when it comes time to revise etc. Knowing that an area is boxed off and dealt with may remove those feelings of being overwhelmed as they only have to deal with the bite sized nuggets that are directly in front of them. So there you are, three reasonably simple practical things you can start doing today to help secure their futures and remove their anxieties. They are by nature repetitious and deliberately so. To best help your child or indeed anyone exploring their options, looking at their futures, the best and easiest thing to do is it develop a plan, even a loose one and then start to tick off little jobs, one at a time so that attacking it all at the last minute when you’ve a million and one other things to do doesn’t happen. It is my sincere belief that little and often from an earlier age is the surest way to develop a keen sense of purpose regarding their futures and removes the crushing anxiety attached to having to make what will feel like knee jerk decisions moments before committing themselves to those decisions for potentially years.